The Lazzara 75 LSX is one of the most innovative designs to be brought to market in the last 10 years. By using four Volvo IPS drives, Lazzara was able to include great deck space, 4 spacious staterooms, a galley and dining table with 14’ headroom, a large salon, an on deck day head, tender garage, and crew’s quarters. Meet us at the Miami Marina to begin your yacht rental adventure, which includes tours of Biscayne Bay and the surrounding Miami area. There will be a captain who will take care of navigating you to the various locations, and a stewardess will see that you are familiar with the boat and its amenities. Accommodating up to 13 passengers plus a Captain and mate, the 75 LSX Lazzara comes with a very extensive standard equipment list and Carpe Diem has all the additional factory options plus many custom features. No expense was spared on the rich and inviting interior. Accommodations for 8 in 4 elegant staterooms all with ensuite bathrooms. The aft deck has a large high gloss African cherry wood dining table with seating to accommodate a crowd. The adjacent bar makes the aft deck the perfect spot for al fresco dining under the stars. The Lazzara 75 LSX is one of the most innovative designs to be brought to market in the last 10 years. By using four Volvo IPS drives, Lazzara was able to include great deck space, four spacious staterooms, a galley and dining table with 14’ headroom, a large salon, an on deck day head, tender garage, and crew’s quarters. Her striking rounded lines illustrate her perfect harmony and practical function. Attention to detail and extremely well designed living solutions provides the utmost in yachting tradition, safety and relaxation. Without the loss of comfort and privacy, this unique four stateroom/five-head layout can comfortably accommodate eight guests plus additional crew. A fully furnished galley equipped to provide all the comforts of home. Incredible performance with speeds up to 30 knots powered by very efficient Volvo IPS 600’s! 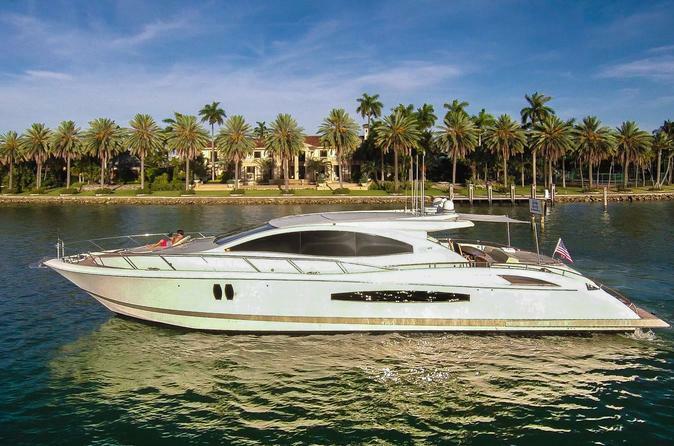 If you are in the market for a stylish and unique Lazzara, you should absolutely consider this yacht. Your yacht rental adventure includes tours of Biscayne Bay and the surrounding Miami area. A captain will take care of navigating you to the various locations around Miami, and a stewardess will see that you are familiar with the boat and its amenities. You will see places around Biscayne Bay and the surrounding Miami area, such as the picturesque skyscrapers and mega yachts along the Miami River; tour the luxurious mansions of Millionaire's Row: Star Island, Palm Island, Hibiscus Island, Dilido Island, San Marco Island and the Venetian Islands; stop for a Beach Picnic at Flagler Memorial Island; cruise alongside the Miami Skyline, or race along the port "Miami Vice" style. You can also anchor for a Boat Party at the Wildly Popular Nixon Sand Bar or dock at Bayside, The Epic, American Social, Salt n' Pepper, The Standard or Rusty Pelican.